Now an anual event! A unique night out for you and your Valentine! 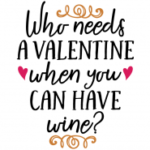 Enjoy a bottle of wine (your choice of Classic White, Gunflint Red or Gris, St. Pepin, GoGo Red, Mill Street, Marquette, LaCrescent, Feisty Red or Rose’, Sogn Blanc or Blush), meat, cheese & crackers, and chocolate covered strawberries in a cute package with your names on it (literally – we do that!) You’ll spend this memorable evening listening to Love Music – I mean Live Music from 6p – 9p by Tim Howe! Nothing says romance like a basket of all that! And ONLY for $35 ($30 for CReW Club members)! You won’t want to wow your love any other way! Purchase your ticket & indicate which wine you’d like (in order notes at check out). Then you show up and we will do the rest! Hurry, tickets are limited! ********REMINDER please indicate which bottle of wine you’d like in the order notes – and the names for the basket – at check out!